We investigate the macroeconomic impact of public expenditure in active and passive labour market policies on main employment indicators (i.e. unemployment, employment and labour force participation) for a panel database of 121 countries (36 developed, 64 emerging and 21 developing economies). Following previous contributions, we implement an instrumental variable strategy to take into account the possible reverse causality between labour market outcomes and spending in labour market policies. Compared to previous studies, (i) we include for the first time evidence from non-OECD countries; and (ii) we examine the possible presence of complementarities between active and passive policies. We find that the interaction between interventions is crucial as the effect of spending in either of the two policies is more favourable the more is spent on the other. 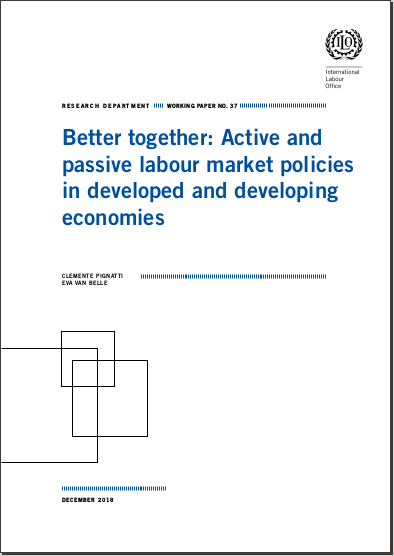 In particular, we find that even spending in passive policies can have positive labour market effects (i.e. reduction in unemployment and increase in employment rates) on the condition that sufficient amounts are spent in active interventions. This complementarity is driven by the interaction between all types of active policies and unemployment insurance (but not assistance). However, this positive complementarity is in place only in developed economies while it becomes negative in emerging and developing economies.